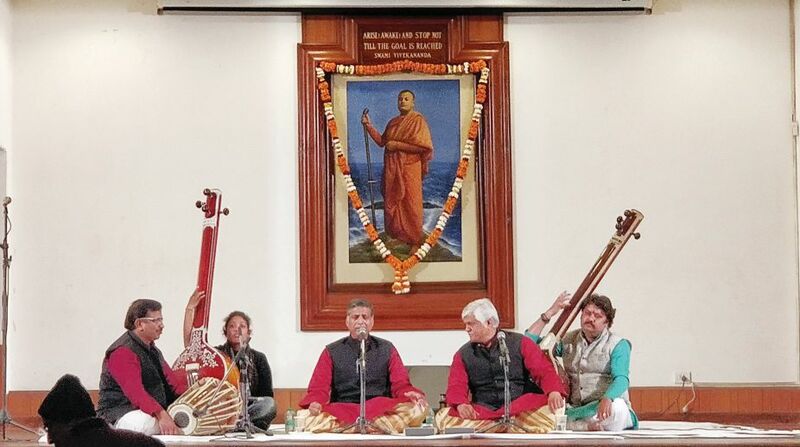 On the occasion of the 156th birth anniversary of Swami Vivekananda, the Sangeet Natak Akademi in collaboration with the Ramakrishna Mission, Delhi organised a musical event to pay tribute to the saint. The cultural mélange also commemorated 125 years of the historic address which Swami Vivekananda had delivered at the Parliament of World Religions in Chicago in 1893. “Vivekananda spoke so much on India and its problems. He was the one who directed everyone’s conscience towards India’s fall and also told how an individual can uplift moral and cultural values in a society and work for the betterment of our motherland,”said Swami Shantatmananda, secretary, Ramakrishna Mission, Delhi. At the musical evening renowned musicians paid homage to the saint with beautiful renditions of Hindustani classical music. Shruti Sadholkar Katkar left the audience mesmerised with her performance of Hindustani vocals. Later, the Gundecha Brothers took the audience on a delightful journey of music as they performed Dhrupad, a genre of Hindustani classical music which Swami Vivekananda himself had mastered. The evening, which was specially dedicated to celebrate Vivekananda’s life, ended with melodic notes from veteran flautist Ronu Majumdar. Speaking to The Statesman, Swami Shantatmananda stressed on taking forward Swamiji’s work and messages and said special attention must be paid to organising programmes, talks and seminars so that the current generation doesn’t remain ignorant of the country’s cultural legacy. Talking about Vivekananda’s importance and relevance in current times, he added,” Swamiji didn’t talk only on Puja and meditation but he talked extensively about cultural and moral decline in human beings. Our youth should take inspiration from Swamiji’s talk on national regeneration and patriotism.